The last 12 months have witnessed a continuation in the declining interest in spin-off hedge fund managers. As shown in the chart below, the proportion of active hedge fund investors interested in such teams fell another percentage point from 35% in 2014 to 34% in 2015. While investors continue to cite track record as a key concern in selecting hedge funds, it is perhaps the heightened interest in larger funds that is leading to fewer investors considering spin-offs. Ninety-two percent of all institutional capital is invested in funds with more than $1bn in assets under management (AUM), despite 75% of investors considering funds with less than $500mn in AUM, as cited in Preqin’s September Hedge Fund Spotlight. This, coupled with the fact that 85% of funds in the industry manage less than $500mn, makes for a very competitive fundraising environment for spin-off managers. A recent example of a spin-off manager is Encompass Capital, which spun off from Citadel Advisors in 2012 and focuses upon energy-related equity investments, now managing $1.1bn in assets (as of 31st December 2014). This includes capital from notable fund of hedge funds managers such as Aetna Capital Management, Grosvenor Capital Management and UBS Hedge Fund Solutions. Encompass Capital Fund Offshore also manages capital from Regents of the University of California which has invested in hedge funds since 2003 and currently has an allocation to the asset class of $4.9bn. Comprising a wide variety of strategies and locations, the pension fund considers both emerging and spin-off managers. Investors that consider allocating capital to spin-off teams tend to be more experienced market players, having on average made their first foray into the asset class in 2001, compared with 2005 for the average hedge fund investor. Data from Preqin’s Hedge Fund Investor Profiles online service shows that such investors are also typically larger allocators to the space, both in percentage and absolute allocation terms. Those considering spin-offs invest approximately $551mn more to the asset class ($953mn) than those that do not consider such investments ($402mn). 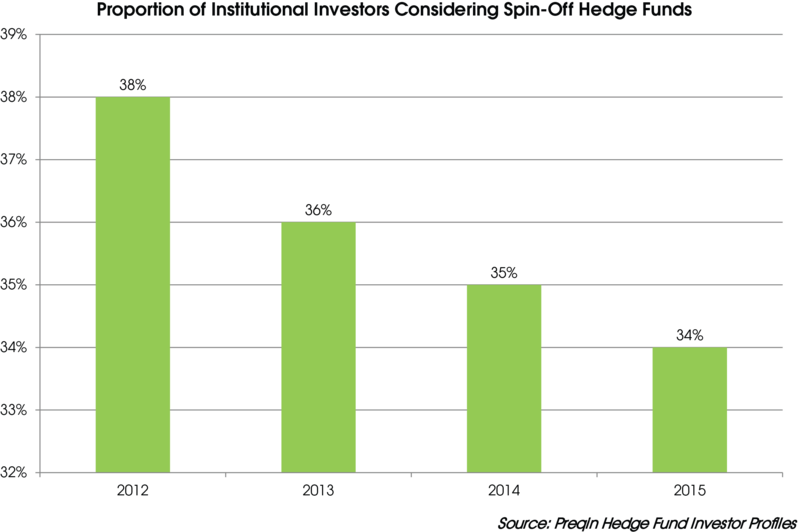 In percentage allocation terms, investors considering spin-offs typically invest 17% of their assets in hedge funds, compared with 13% for those who do not consider such funds. With the majority of investor capital being allocated to the largest funds and interest in spin-off funds declining, fundraising may prove difficult for spin-off managers. However, industry expertise and existing relationships of such managers may help them to stand out from the crowd of smaller funds (85% of all funds in the industry manage less than $500mn in assets). The fundraising outlook also seems less bleak when considering that more established investors, particularly funds of hedge funds, continue to express an interest in such funds.